It is yet another childhood event I will never forget. I must have been then in 5th or 6th standard. I remember very well it was two days go for the Raja festival. As usual we were there at our village to celebrate it. Everywhere different preparation was going on for the three days festival. More or less when everyone was busy we kids played near the canal bund. 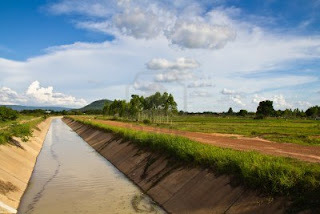 There was little water flowing in the canal and the bund road was dry and rough with red morum. It was hard to walk bare foot on the bund road. This No-12 branch of Cuttak Canal is a part of our little village. It provided all basic need of water usage starting form irrigation, washing, fishing etc to the villagers. The kuchha bund road acted as a major bypass to those who wanted to avoid long connecting village road. But during rainy season it becomes very difficult to travel on the bund road. It was about noon, while we were playing under the shed of couple tree near the canal bund. My cousin Mitu, had a habit of doing mischief. He made fun of every passerby and make fun of them. Crackle of laughter would follow, when the victim of Mitu's mischief react by uttering village slang and scolding us. Though then, I did not knew the meaning of those slangs but today I know how nasty they were. While we were busy in our teasing activity. We saw a very unusual sight. It was of a thin tall ebony bearded man covered only in his loin cloth proceeding strangely on the canal bund. He was laying straight then standing up and again laying straight (like caterpillar movement). It was hard for me to understand, for what he was doing so. He was followed by few people at his behind. This time Mitu, thought not to mock. Led by him we all kids proceeded to witness the happening. The man kept on doing the same thing. It must have been very painful for the man while he was doing so. He had a white chalk in his hand and he marked each and every time he laid down. I think he was counting every time while he was laying down. We were told he was doing some kind of penance which was suppose to end when he travel like this up the famous temple of Goddess Sarala. He pledged not not to talk with any one during the penance. When anything was asked to him, he used to pause and reply by writing in odiya on the soil. Though it was very tough for the man, but he kept on doing it. For me it was equally strange and appealing. Why would one do like this to himself. I was so moved that I thought to publicize this person and about his penance. Then I told all the gathered people that we must write to the local news paper to publish about his penance. The man must have heard me saying such. He paused for moment and looked at me and wrote something in the sand. I told, 'I will try to...I will contact local news paper people'. I had then my own doubts. Who will listen to a young boy like me. There was smile in his face and he proceeded further. We followed the man to some distance and then watched him till he was out of sight when the canal turned to the left. I kept on thinking about the man for the whole day. In two days the festival started and when a cousin like Mitu is around, you forget everything. I forgot about the assurance I gave to the man. Three days after the festival, while I was busy for packing to go back to Bhubaneswar, few village kids came running to our house and said a man with white Dothi and Kurta is inquiring about me on the canal bundh. My mother was confused. Why would a man asked about me. When we all went to the canal bund, I could see the same man, who must have shaved of his beards and mustaches standing beside a person with a cycle. He smiled at me. His smile made me remember of my assurance to him.
" How are you kid? Do you remember me?" "Yes, I do", I replied with a smile. "You told that you will write about me"
"No I didn't say such , But I told that, I will tell news paper people to write about you"
"Yes, Yes, Do you want to know why I did the penance?" "Yes, Sure. Then only I can tell them about your story"
The Man paused for a moment and closed his eyes. His eyes were moist with tears. He said with a voice heavy with emotions, " My only child, my daughter was suffering from cancer. She is only 7 years. I am a poor man, I have sold everything in her treatment. I had promised to do everything to keep her alive. It was the grace of Maa Sarala, she blessed her life. Doctor say she is out of danger, but she has to be checked regularly. I had taken a pledge, If my daughter gets well, I would travel with sastang pranami from my house to Maa Sarala's Temple and which I successfully did for my daughter." My mother's eyes were moist, who was eagerly hearing the man word by word. the man paused and asked, "will you write about it?" I replied, "I'll try" and asked, "What is your daughter's name?" Back in Bhubaneswar, I wrote about the event to the local Odiya & English News Papers. I was sure it was must have landed in the dustbins without being read. But after 20 years, I realized, how unique the man's love for his daughter was. A lucky daughter. But not everyone is lucky like her.